New Jersey Department of Health and Senior Services Office of Emergency Medical Services (OEMS) does not recognize CPR training programs that are taught strictly on-line. 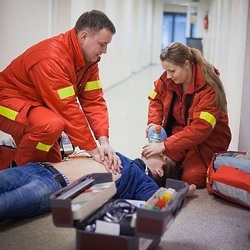 CPR certification must be obtained through an instructor led program with skills verification, a written examination, and include both one and two r escuer CPR (infant, child and adult), use of bag-valve mask ventilation devices (BVM) and semi-automatic external defibrillator (SAED) training. OEMS does not accept handwritten certification cards or letters from CPR instructors, as proof of CPR certification.